I like non-sports cards of television shows I watch. 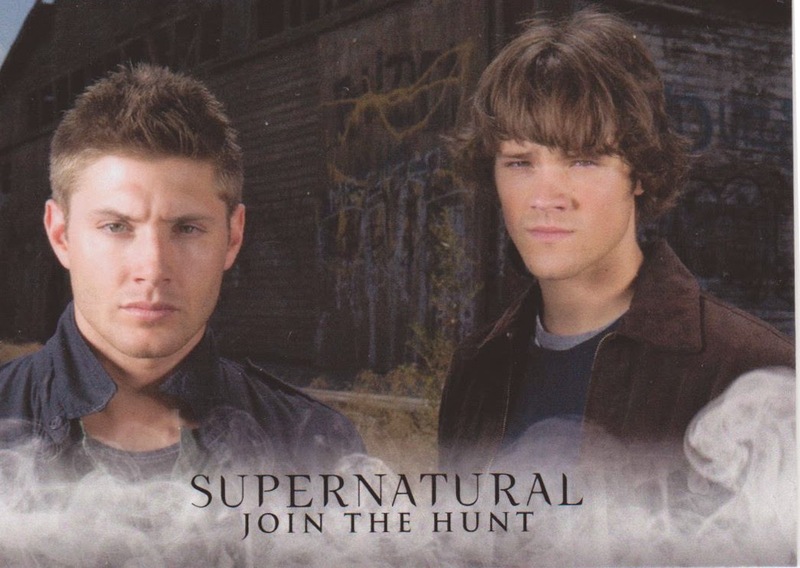 I love non-sports cards of my FAVORITE show. 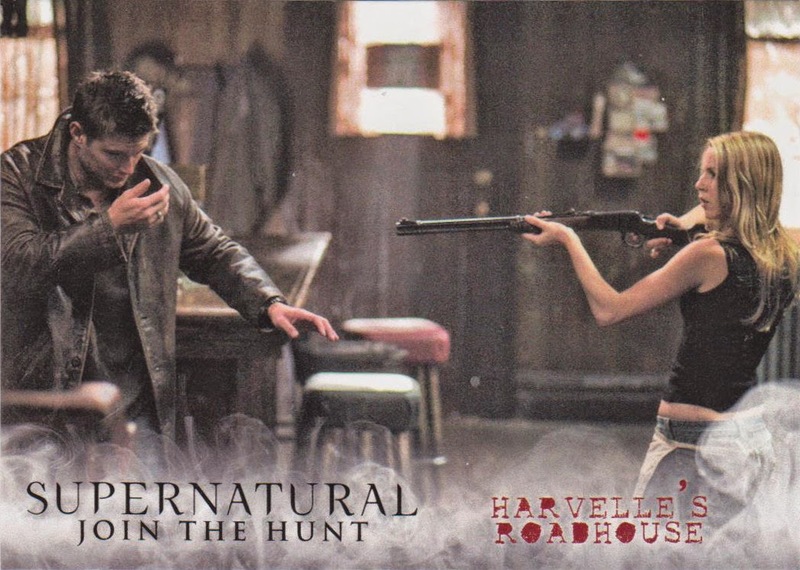 Several years ago, Inkworks made a couple of Supernatural cards. I picked up some over the years, but at the time of their release, I wasn’t into non-sports cards so I didn’t get them as they came out. Then Inkworks went out of business. 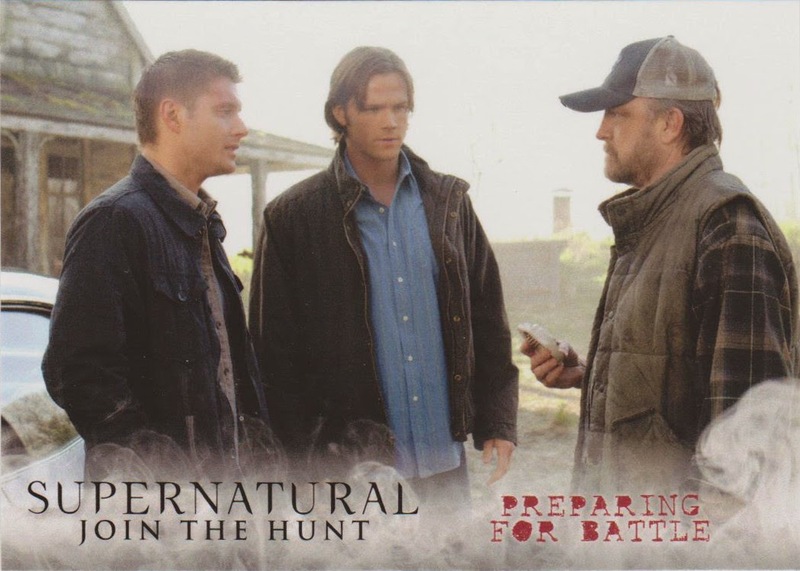 When Cryptozoic announced it was making Supernatural cards, I was getting in on the ground floor. At the time of the announcement, I wanted to buy a case. However, as the date got closer, a few names were taken off the autograph list – most notably the two main stars. Well, my itch to buy a case diminished, but the hunt wasn’t going to end. While at the White Plains card show this weekend, I picked up a box for a good price for a new release. 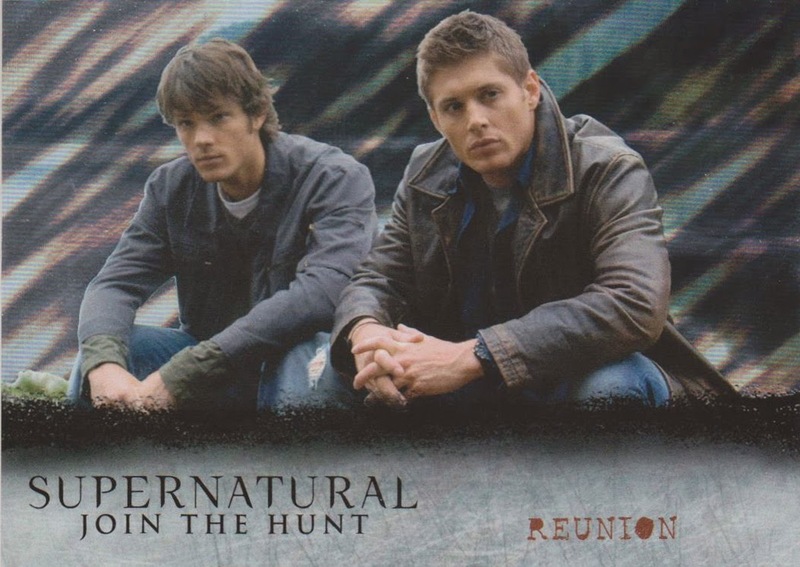 Supernatural Seasons 1-3 was a standard set from Cryptozoic. The base set features 72 cards highlighting the biggest moments from the first three seasons. I enjoyed going through the cards, looking at all the moments that made me fall in love with the show. It was also a reminder of all the characters that are no longer on the show for various reasons. Many of my favorite characters appeared on these cards. 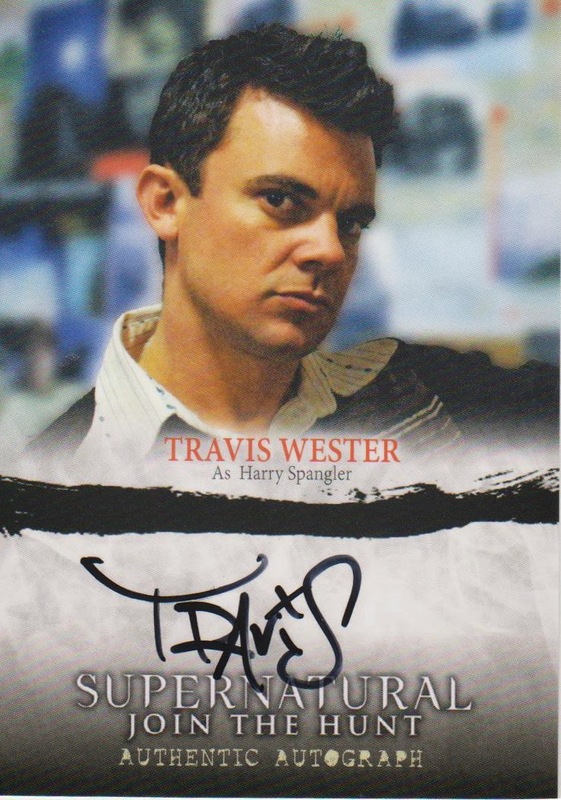 Each box also comes with one autograph and one wardrobe card. I let out an audible groan when I saw my autograph card. I was eventually going to own this card, but I didn’t want it to be my pull. I would have much rather have gotten this card on eBay and pulled a different person that had a greater impact. 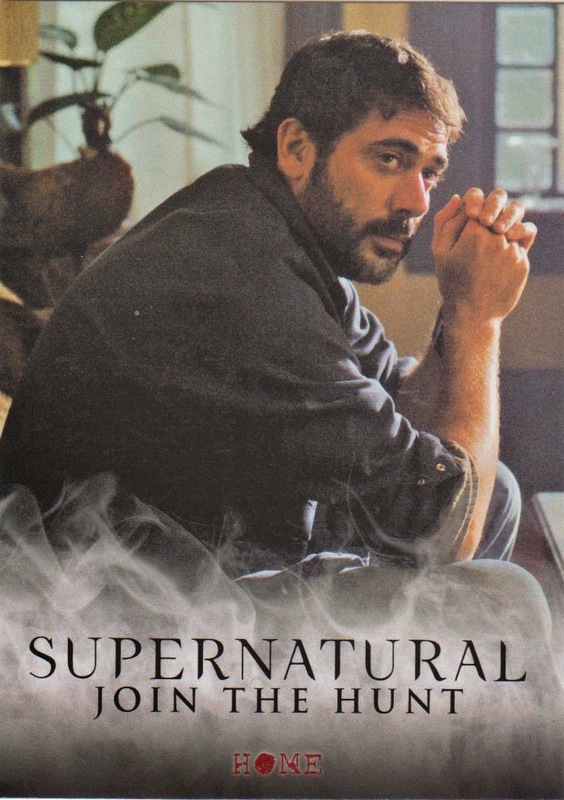 OK, let me re-phrase I wanted a Jeffrey Dean Morgan autograph and nothing else. So, I was probably going to be disappointed regardless. However, my wardrobe card got a “yippee” from me. On the short list of wardrobe cards I wanted, this was definitely in the top three. 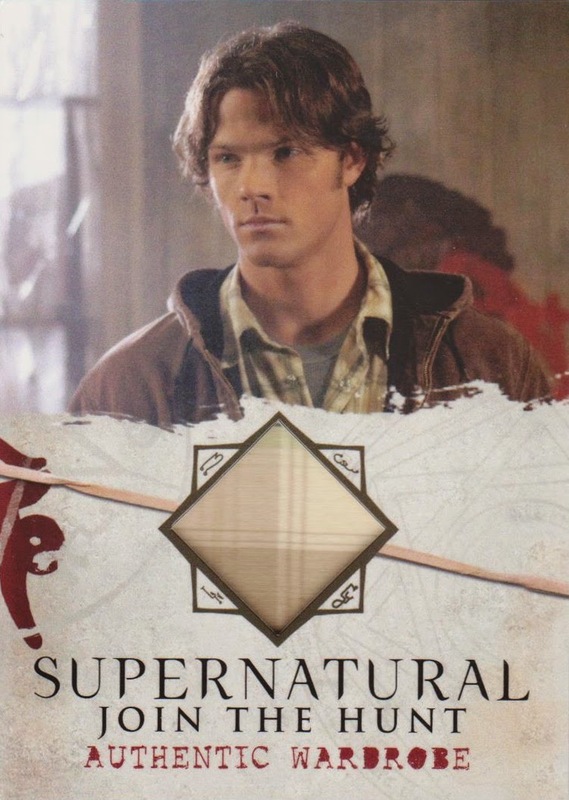 A Jared Padalecki (Sam Winchester ) wardrobe card – one of the two main stars. 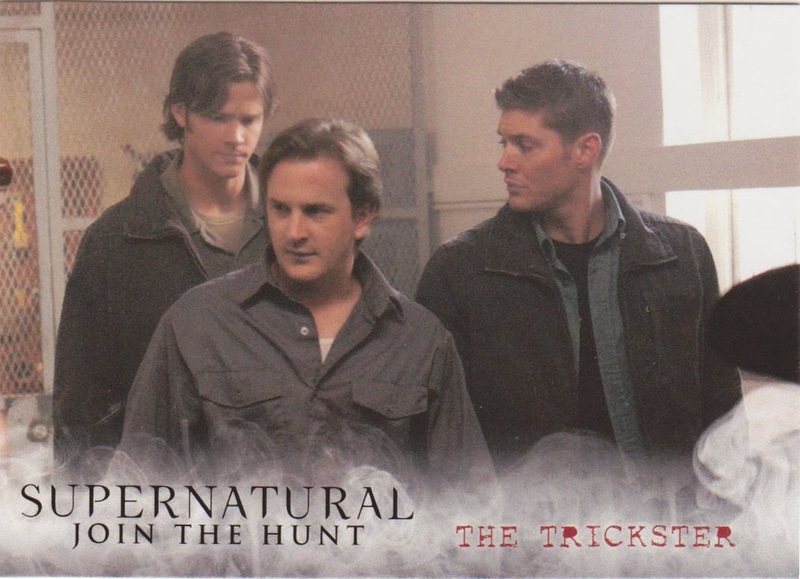 If I was not going to get an autograph of the brothers because they weren’t in the set, I am happy that I was able to at least get a wardrobe card. 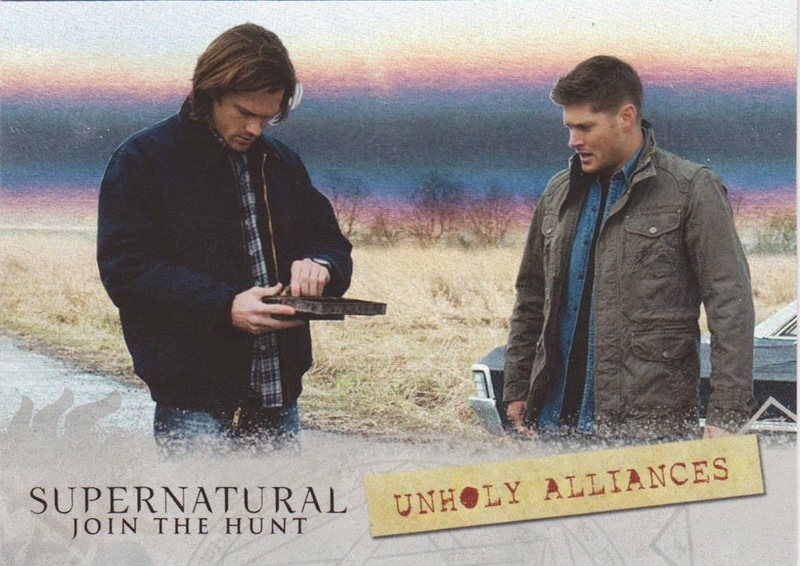 The neat thing about the card is I’m pretty sure the relic is from the shirt Sam is wearing in the picture – crazy concept. The inserts weren’t my favorite – or chase cards as they are called in the non-sports world. They used the same pictures from the base with just a different back. 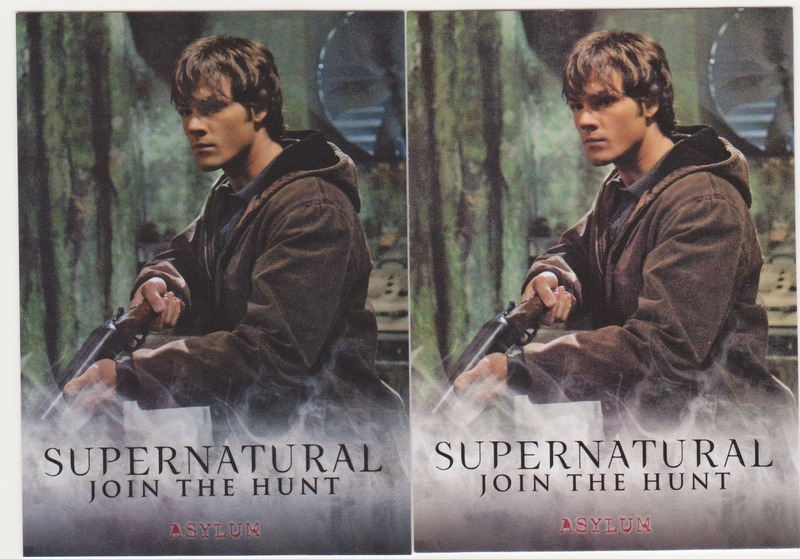 This may be because of image rights and Cryptozoic was given only certain images they could use (this is just me speculating), but I would have liked to have seen different pics on these cards. My favorite card is probably the Shadowbox Character Bio card. I pulled Bela, which ain’t bad. I enjoyed her character as I thought she was nice foil for the boys. 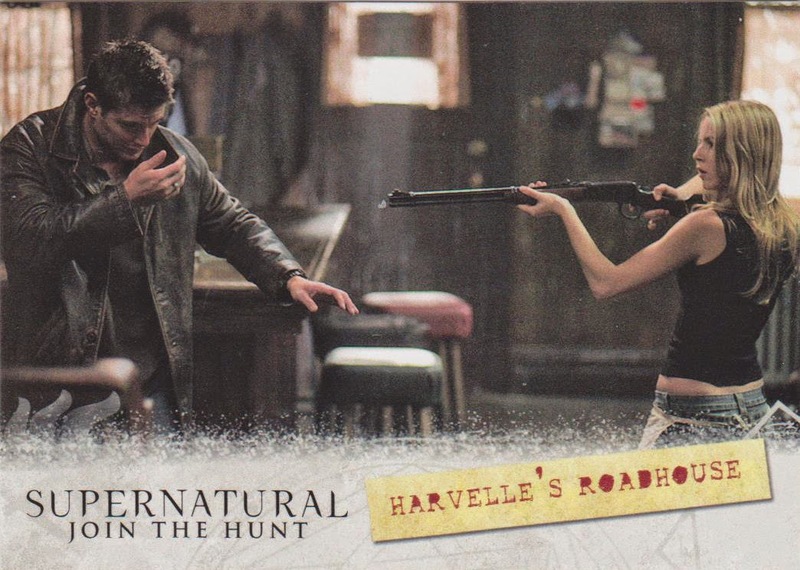 The other chase cards included Winchester Brothers and Locations. There were also foil board parallels of these cards. I haven’t figured out if I plan to chase the entire parallel set because I am not entirely sure what is available yet. The two foilboards cards above were noticeable and one was numbered to 25. They were of the chase cards and not the base set. However, look at these cards – one is a parallel. Which one? The one numbered on the back to /25 because that was the only way I noticed it. I thought it was a double and as I was looking at the backs, I saw the serial number on one. After holding it in the light eight different ways, I finally saw a bit of a rainbow sheen. It’s not a well-done parallel. Having said all that – let the chase begin. 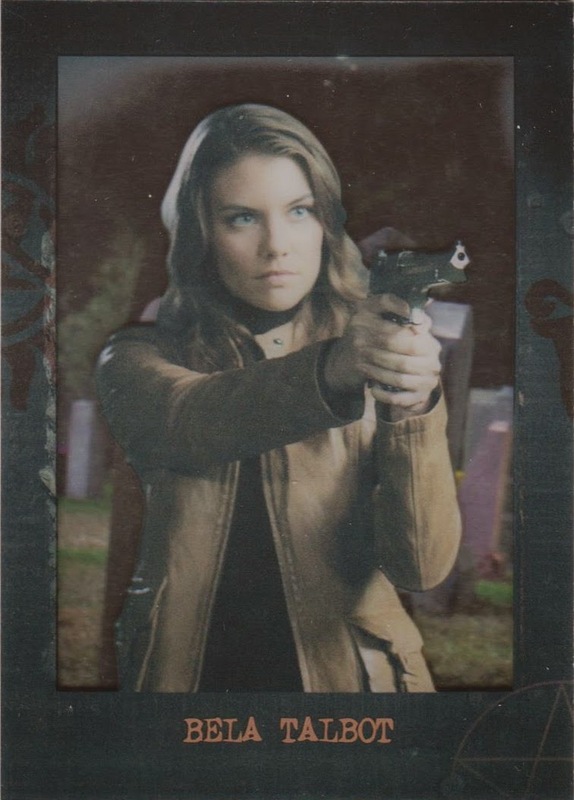 I've never seen Supernatural, but I thought that "Bela Talbot" looked familiar... Then I found out that it's Lauren Cohan, who plays Maggie on The Walking Dead! 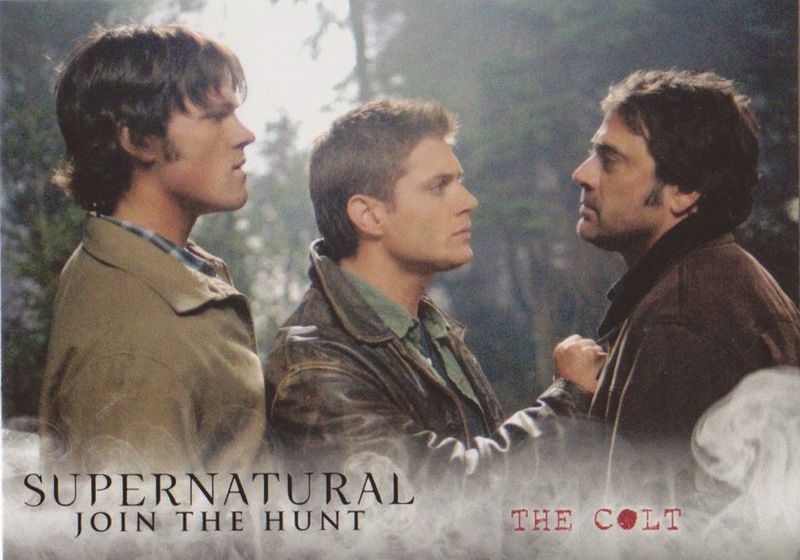 Now I've got a Supernatural card on my wantlist.